Sold a couple books yesterday. An animal or wild toddler happened to poop in the neighborhood pool and our residents were all over it on our neighborhood Facebook group. I offered an indoor option for summer entertainment instead of swimming in poo. A couple neighbors decided a good book on the couch is better than that alternative. And, hey, when the pool is decontaminated, they can read poolside. So what are YOU waiting for? Avoid the poo-l and curl up with a book. My free time hasn’t been spent at the poo-l much lately. I’m usually geeking out on the weekends. This past weekend it was more Devastation of Indines and then on to Cosmic Encounters and finally, Sentinels of the Multiverse. After that, I wrapped the weekend with an ongoing Civilization 4 game with a good friend. Our GM for Tribe 8 fell in battle with a local dentist, so that was postponed. I must mention that I destroyed @TheDsm and his lame zombie-rocker hero in Devastation of Indines. I played Ottavia Six, a ranged character with a few close-up surprises. Zombie boy had the most awkward ranges possible and several effects that worked only when the opponent was standing on the zombies which he shat all over the board. I pretty much made sure not to do that. I haven’t been keeping track, but we may be developing a bit of a rivalry here and I think I’m up on the wins. Cosmic Encounters was a fun game. I’d played the original version years ago with the euclidean sort of black and white pieces representing the warp, planets and the cone thingy. This one had all new artwork, stackable plastic ships, and had thankfully shunted the Zombie race to an advanced group of races. This game went very much like the only other time I played – I got a terrifying race and everyone decided I needed to die. Last time it was a shapeshifter which I used to steal someone’s Zombie race. This time, I was the Amoeba, a race capable of invading planets with hordes of ships. I hung in there and refused the healer race’s “aid”. Everyone but myself and the game’s owner decided that the Healer was a harmless altruist. They figured out that might have been a bad idea when he had 3/4s of the deck as his hand by the end of the game. In one of the most awkward endings, he offered an open alliance that would have allowed everyone but the guy who brought the game to win by carving up that unfortunate soul’s planets. My Amoeba’s found a heart (or formed one through some incredibly complex evolutionary event) and cancelled the alliance, trying to reinforce the opposing player. It was the last turn, we were facing a deck of cards, so we got slaughtered. However, only one person won and the Amoeba’s showed the intergalactic community that they too could someday join the federation and be odd, but honorable, citizens. 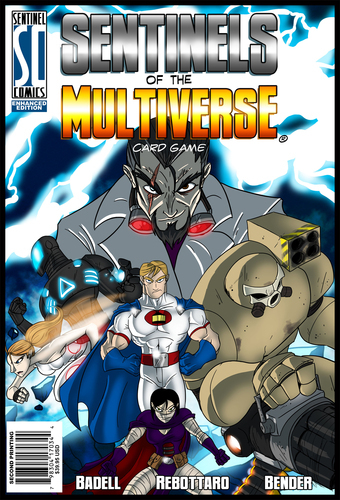 Our Sentinels of the Multiverse game was rushed – we were closing up the gameshop. A superhero deck game with quick playing rules and unique combinations with each hero led to some of the better co-op play I’ve experienced. Many times, like with say Pandemic, the group play becomes such a case of group think that you rarely feel you have input on what happens. With Sentinels, each hero was unique enough and with a handful of play options each round, it felt there were many right answers for how your character could contribute to the group effort each round. I look forward to playing Sentinels again and wouldn’t mind a Cosmic rematch though, in any game with battle, I prefer a bit more strategy than random card draws. Okay, back to selling books. I’m still the Amoeba, struggling to assure everyone I’m not some rushed-to-publication beast and the campaign is moving right along, slow and steady. But thanks to everyone that has bought thus far – I’m still amazed everytime I see a sale pop up. Give me your honest feedback – here, Amazon, B&N, Goodreads, an e-mail, wherever. I want to know what you did and didn’t like about Crimson Son so I can keep providing interesting stories for everyone to read! I will defeat you Russ… someday. I will defeat you… someday. This reminds me of that kid that used to be at our house. Casey and Brian would come over and play games on the computer for hours! Hours, days, who kept track? Back to being on the computer for hours now…both fortunately and unfortunately! Mom finished your book. She liked it gave you five stars of course you are our son but anyway you kept her interest through out the book. She also could not figure out the ending like she does in most of the books she has read!! Good Job, great read! !